Acuité Ratings expects a significant build-up of NRI deposits in the current financial year in the backdrop of a significant depreciation in the rupee vis-à-vis the dollar. 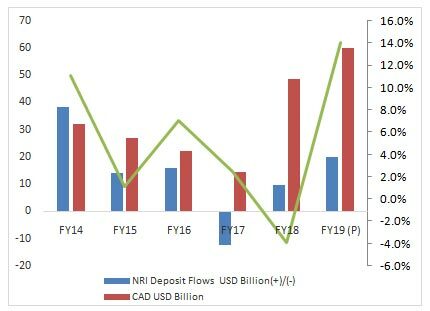 In the first 5 months of FY19, the net inflows of NRI deposits stood at USD 5.7 billion as compared to just USD 0.5 billion in the corresponding period of previous year. Given that the major proportion of NRI deposits originate from the Middle East and the oil prices have been on an upswing in addition to the weakness in rupee, we believe that the net inflow of these deposits may touch USD 20.0 billion in the current year. This will partly help to bridge India’s current account deficit which is expected to exceed USD 70.0 billion in FY19. Nevertheless, structural measures may need to be taken to improve our trade balance and arrest the increasing trend in the current account deficit (CAD). A study by Acuité Ratings indicates that over the 5-year period 2014-18, the net inflows of NRI deposits have been a significant 46% of current account deficit. It has also been observed that there is a healthy correlation between oil prices and NRI deposits (correlation coefficient at 0.65) and any spurt in oil prices pushes up the flows of such deposits. 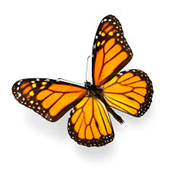 These deposits offer an attractive return on dollar deposits as compared to that in foreign nations while allowing a repatriation of its proceeds. A substantial part of these deposits also accrues from the diaspora in the OPEC nations where disposable incomes also rise during a cyclical upturn in oil prices. Acuité’s analysis further reveals that there is a strong correlation between net remittances and NRI deposits flows, both showing good momentum during a phase of higher oil prices and pressures on the rupee. This to an extent, acts as a natural hedge against any sharp erosion in the value of the rupee during periods of high volatility in global financial markets. The government and RBI have taken measures in the past to attract a higher quantum of NRI deposits. However, any sharp upsurge in such deposits over a short period may not be necessarily favourable over the longer term as these deposits are repatriable and can therefore lead to sudden currency outflows in future periods. While regular NRI deposit flows support to maintain a healthy capital account balance, these flows are not a solution to the fundamental weaknesses in India’s current account. What can help at this stage is to adopt structural measures to limit the extent of current account deficit which is expected to exceed 2.5% of India’s GDP in the current year. India’s trade deficit has sharply risen to USD 160.0 billion in FY18 and is likely to rise further in FY19 unless steps are taken to boost India’s exports. The country is expected to have a healthy production of food grains and other agricultural crops in both the kharif and the rabi seasons which presents opportunities to increase our agricultural exports particularly to nations such as China. India has a trade surplus in agriculture, but the extent of that surplus has dwindled from USD 27.2 billion in FY14 to USD 13.4 billion in FY18. Given the trade wars between US and China, there is a significant potential to increase the exports of agricultural products such as cotton, soyabean and corn to China. The other measures to stem the trade deficit is to reduce the extent of commodity imports such as coal to the extent possible through a step-up in investments in coal mining and transportation infrastructure. The Government of India has taken a few proactive steps in addressing these objectives with initiatives such as exclusive agro export zones as well as related logistical improvements. In the longer term, it is important to make the Indian economy resilient to commodity volatility that continues to haunt the external sector. A higher value addition in the export content along with de-dollarization of imports are necessary milestones in that regard.